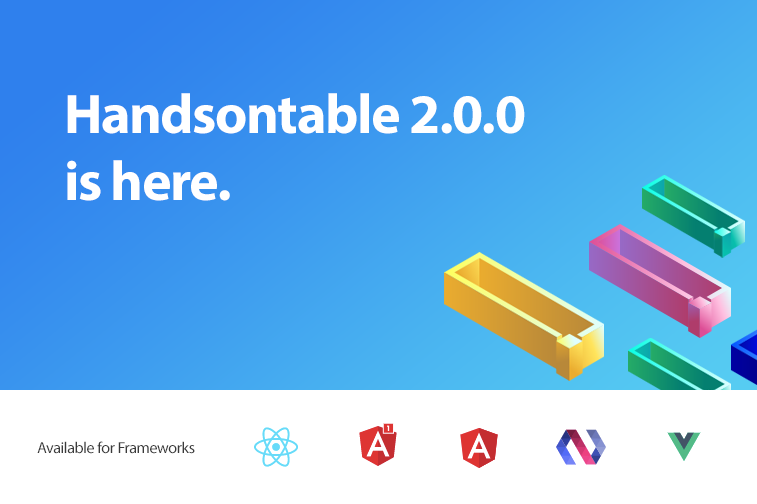 We are happy to announce that Handsontable (CE/Pro) 2.0.0 is finally here. It’s hard to believe that it took us 6 years to bump the major version of our best-selling software. It’s a small step for mankind, but one giant leap for our team. Handsontable is a long-run project, with many projects heavily depending on it. That makes us responsible for keeping these projects running smoothly by providing a reliable and semantic versioning. We believe that this can be achieved by applying the rules outlined in Semantic Versioning Specification (SemVer). If you are not familiar with SemVer, then read the summary below. It briefly explains how SemVer defines the version numbers that are incremented during each release. Major version (1.x.y) indicates that there has been a backward-incompatible change in the existing API. Minor version (x.1.y) indicates that a new, backward-compatible functionality has been added to the public API. Patch version (x.y.1) indicates that there has been backward-compatible bug fix. The key advantage of SemVer is that it is predictable. If you set a version range allowed for a specific dependency, you can be sure that it won’t be bumped without your control and consent. This makes the development much more comfortable, but requires being more attentive about the latest news and upgrades. For Handsontable, you can always find them on our Blog and Twitter. We live in the world of npm, Yarn and other package management systems. It means that more and more apps rely on what has been specified in the dependencies object. Obviously, being SemVer-compatible makes Handsontable much more developer-friendly. We equalized the version numbers of Handsontable Pro and Community Edition. Different version numbers were confusing for our commercial customers. We’re going to merge documentation for Handsontable Pro and Community Edition. The current version will be available at docs.handsontable.com. All the legacy versions will be moved to the searchable archive. We’re going to merge the repositories of Handsontable Pro and Community Edition. Commercial plugins (such as Filters or Nested Headers) will be put inside a separate directory with their own commercial licenses. I want to make it clear: This Handsontable 2.0.0 release is a purely technical update. We haven’t added any new features or made any significant changes to the API. This change was long awaited and we didn’t see any reason for delaying it any longer. I think we chose a moment as good as any. In the upcoming releases, between May and July, we will be moving towards a single repository holding both open source and commercial plugins. It’s a licensing nightmare, but we’re on the right track to figure it out. We also hope that the new documentation will be more friendly for developers coding in React, Vue, Angular and Polymer. Rewritten the Search and Custom Borders plugins to ES6. (#4892, #4621). These plugins will no longer be available from the main Handsontable instance. They will be accessible analogously to other plugins, as hot.getPlugin('search') and hot.getPlugin('customBorders').